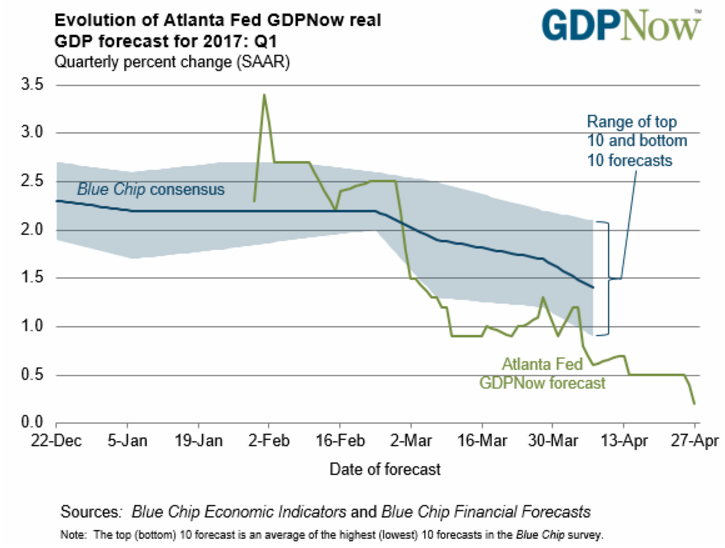 President Trump will not be very happy if the Atlanta Fed's final estimate for the first quarter of US GDP under his watch is correct. 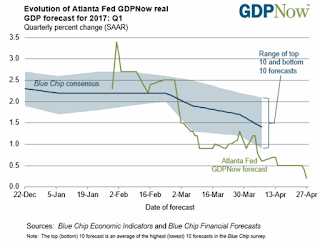 Today the Atlanta Fed announced its last estimate for Q1-2017 GDP before it switches to estimating GDP for Q2-2017 on May 1, 2017 (next Monday). The forecast of first-quarter real consumer spending growth fell from 0.3 percent to 0.1 percent after yesterday's annual retail trade revision by the U.S. Census Bureau. The forecast of the contribution of inventory investment to first-quarter growth declined from -0.76 percentage points to -1.11 percentage points after this morning's advance reports on durable manufacturing and wholesale and retail inventories from the Census Bureau. The Atlanta Fed's estimate was over 3% in early February but has plunged towards zero since then.